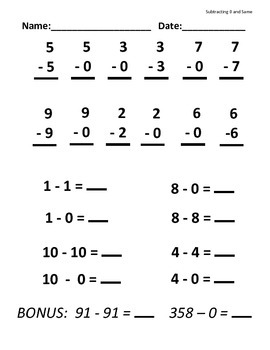 This is a basic computation worksheet created to test my student's understanding of subtracting 0 and subtracting same (once they learn a rule/ concept, they tend to not confuse it with other such rules/concept. This worksheet is to help them learn to actually think about the problem, and decide which rule/concept is needed. I use it after teaching both subtracting 0 concept and the subtracting same concept.